I've always heard great things about Folkestone Triennial and this year made a point of getting down to the coast to explore. double edge describes itself as one of the UK's most ambitious art exhibitions, with 20 specifically commissioned contemporary artworks placed around the town. "The exhibition is designed to be enjoyed while walking, with the town and the art experiences together. double edge invites you to think, and talk, about how every point of view has its opposite, and how to bridge the gap between these to live together peacefully in a beautiful place." We decided to approach our visit in an unstructured way, rather than follow the trail, we simply explored the town, stumbling upon artworks as we went. I intend to visit again to explore further along the coast. 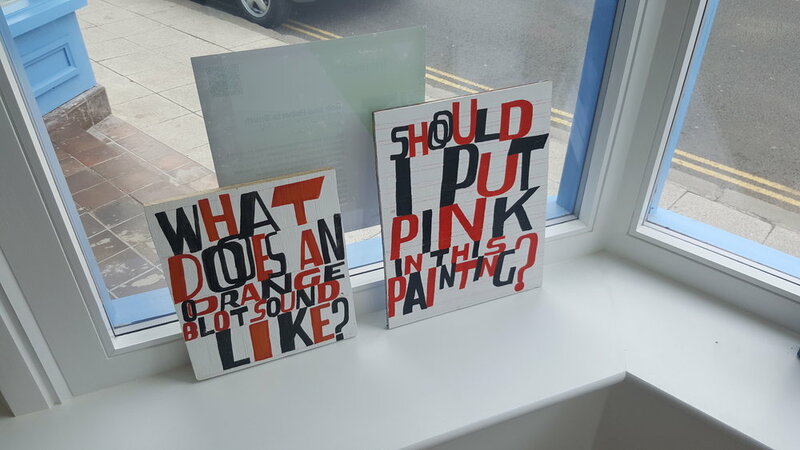 On Harbour Street we found work by Bob and Roberta Smith, along with a place to take part in workshops. Next, on a mission to find a cash machine, we stumbled upon my favourite work, The Clearing by Studio Ben Allen. We spotted the wooden structure walking past the Quarterhouse, abandoning our cash mission to find out what it was. The work was inspired by a clearing in a forest and the moment of orientation when you stop walking and appreciate where you are. The structure was build out of untreated wood, prefabricated to slot together to create what feels like a cathedral. We spent a long time in this space, looking up at the ceiling and feeling really lost in the atmosphere. It really felt like something from a dream. Once we finally found a cash machine we were back on track with exploring the town. We came upon the first of the six Holiday Homes by Richard Woods. Each a different colour and sited in 'unlikely' places around the town. The artist also wanted the houses to draw attention to the 'housing crisis' resulting from the tax policy decisions of successive governments. On our walk through the town we found a number of smaller gallery spaces open, one such space grabbed our attention. The Raft by Andrew Holmes is made up of four large format unframed black and white photographic prints of the sea. His images show the sea at night, rain lashing down threatening to drown. His view of the sea comes from a number of perilous experiences at sea. I found this work really powerful. We headed further along the coast, drawn by Bob and Roberta Smiths Folkestone Is An Art School. This work comes in four parts throughout the town, the one in the image below sat on a cliff looking out to sea, we didn't get too close though as there were too many golf balls flying around and we didn't fancy getting injured. So our next stop was at Siren by Marc Schmitz and Dolgor Ser-Od. Inspired by the 'listening ears' along the coast. Siren evokes an unfamiliar technology, amplifying distant sounds from out at sea and speaking back becoming a megaphone if you shout into it. 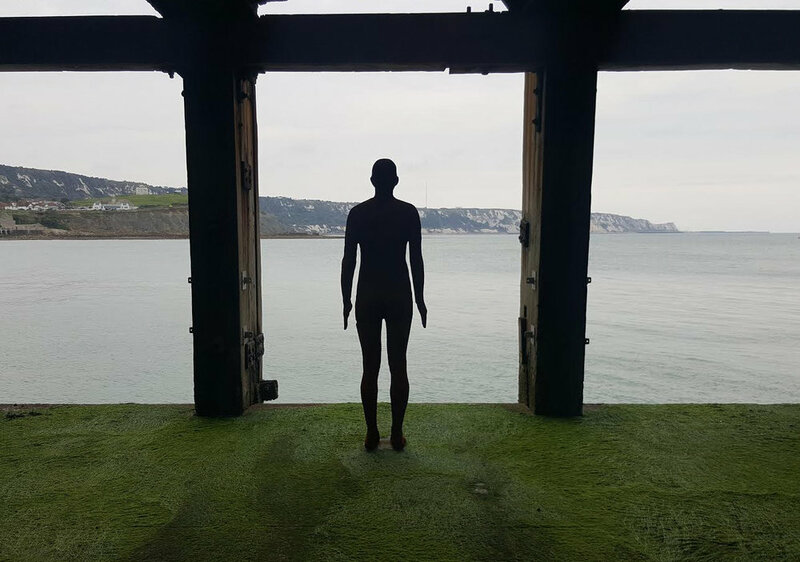 On route to the Harbour Arm for a cider or two, we stopped to see the Anthony Gormley sculptures, each a weathered figure staring out to see. I particularly liked the one on the Harbour Arm itself. After all this we were pretty hungry, so we went to our usual Big Boys Burger. 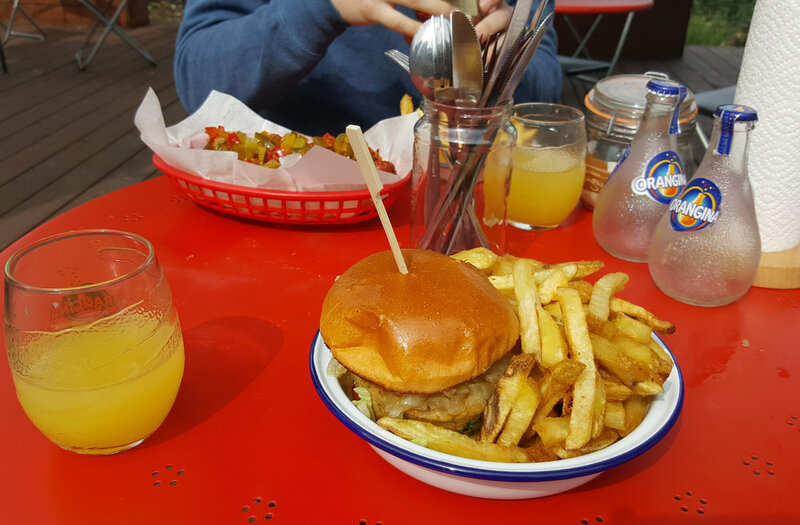 I can't reccomend this place enough, The Chick is particularly delicious (and veggie). I hope you enjoy your visit as much as I did mine!